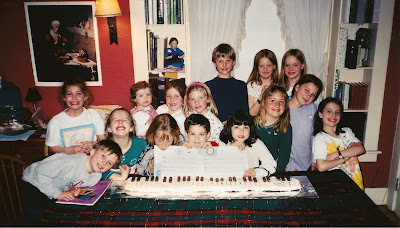 Here is a photo of Janie's piano students at an end-of-the-season recital party in 1999. I'm not sure which is cooler: the fact that she taught 14 kids (plus Carly) or that epic full sized piano keyboard cake! If any of you kids read this blog, can you share where you are at today? Still playing music? Oh my, is that me holding Carly?! Thanks for sharing this Chris! Janie inspired me to love music, almost as much as she did. Thanks to her persistence, I have played piano for 15 years, 10 of which I took lessons, 6 or 7 of those years I took lessons from Janie. She was an incredibly gifted and fun piano teacher! My favorite part about lessons was when she would reward me with M&Ms for naming keys on the piano or the names of notes correctly. However, I distinctly remember a lesson where I did not receive any chocolate because you (yes, I mean you Chris Booth) had eaten the stash of M&Ms meant for her students. I the only reason I remember this is because I was scarred for life. I still have all of the music Janie ever copied for me, and all of the folders with various stickers earned for mastering a song. Anyways, Janie's love for music was contagious. Every time I listened to her play, I could feel her love for God seeping through the keys and into my ears. There was just something about listening to her play piano... God certainly blessed her with musical talent and a fearless will to play for any event, Christmas pageant or church hymn sing. Janie encouraged me to have that fearless will, telling me to share my musical gift with other people because God's gifts are meant to be shared. Also, I can recall a Sunday morning spent at the Booth Household. We were all about to hop into various cars on our way to Ira for church when Janie reminded us all, "Choose your music carefully, it's God's day." I will never forget that moment because it completely changed my life. Janie always reminded me that everything belongs to God, even the music we listen to. So, of course I still play piano, but not every day like I used to because copious amounts of reading and papers that now occupy my time. College certainly has had a toll on my musical expression, but I've learned to cope by listening to music, learning to play the guitar and I've played with a few worship bands here at UVM. Look forward to seeing you and the family over break! As so many others, Janie had a huge impact on my life and my music. She was my first paino teahcer and though I went on to have many others she was one of the most influetial and definitely the most inspiring! The first "real" song I learned with Janie was "As the Deer", I can't think of a more appropriate song to describe the impact that Janie made. She certainly panted after God like the deer pants for water and depended on God to be her strength and shield. I graduated a year and a half ago from college with a Bachelors degree in music and still play in church & for the worship team. I can't say how many pieces of music I still pull out to play for offeratory that have have Janie's writing and marks all over them. I find myself smiling and imaginging Janie smiling down from Heaven and listening in. Abby and Beth....thanks for sharing....you made my day. Abby, I would *evil laugh* take the M&M's from you any day. Janie's only-ever failure to teach someone piano: me! I tried and quit so as to save our marriage. I am such a musical failure. SOMEDAY!! Heaven probably! Oh and Beth great to hear from you!! It's been a while hasn't it! I'm somewhat caught up on you guys...but so sorry we couldn't make it to the wedding....love and miss you and say hi to the whole fam for me!! Not true, Chris! You are a musical genius! You play the stereo like a MASTER! ah but you're a music teacher, Carol, so that counts................you're welcome here any time!